During the Gilded Age, America developed its mass production, scientific management, and managerial skills. Large corporations or trusts managed the manufacturing of raw materials such as coal, iron, and oil. The Bessemer process for manufacturing steel led to America’s first billion-dollar corporation, United States Steel. Improvements in workflow, such as mass production and scientific management, contributed greatly to economic growth. Second Industrial Revolution: The Second Industrial Revolution, also known as the “Technological Revolution,” was a phase of the larger Industrial Revolution corresponding to the latter half of the nineteenth century until World War I. It is considered to have begun with Bessemer steel in the 1860s and culminated in mass production and the production line. Bessemer process: The first inexpensive industrial process for the mass production of steel from molten pig iron. The Second Industrial Revolution, also known as the “Technological Revolution,” was a phase of rapid industrialization in the final third of the nineteenth century and the beginning of the twentieth century. The First Industrial Revolution, which ended in the early-mid 1800s, was punctuated by a slowdown in macroinventions before the Second Industrial Revolution in 1870. Though a number of its characteristic events can be traced to earlier innovations in manufacturing, such as the invention of the Bessemer process in 1856, the Second Industrial Revolution is generally dated between 1870 and 1914 up to the start of World War I.
Advancements in manufacturing and production technology enabled the widespread adoption of preexisting technological systems such as telegraph and railroad networks, gas and water supply, and sewage systems, which had earlier been concentrated to a few select cities. The enormous expansion of rail and telegraph lines after 1870 allowed unprecedented movement of people and ideas, which culminated in a new wave of globalization. In the same period, new systems were introduced, most significantly electrical power and telephones. A synergy between iron and steel, and railroads and coal developed at the beginning of the Second Industrial Revolution. Railroads allowed cheap transportation of materials and products, which in turn led to cheap rails to build more roads. Railroads also benefited from cheap coal for their steam locomotives. This synergy led to the laying of 75,000 miles of track in the United States in the 1880s, the largest amount anywhere in world history. By 1900, the process of economic concentration had extended into most branches of industry—a few large corporations, some organized as “trusts” (e.g., Standard Oil), dominated in steel, oil, sugar, meatpacking, and the manufacturing of agriculture machinery. Other major components of this infrastructure were the new methods for manufacturing steel, especially the Bessemer process. The first billion-dollar corporation was United States Steel, formed by financier J. P. Morgan in 1901, who purchased and consolidated steel firms built by Andrew Carnegie and others. Diagram of the Bessemer converter: Air blown through holes in the converter bottom creates a violent reaction in the molten pig iron that oxidizes the excess carbon, converting the pig iron to pure iron or steel, depending on the residual carbon. Increased mechanization of industry and improvements to worker efficiency increased the productivity of factories while undercutting the need for skilled labor. Mechanical innovations such as batch and continuous processing began to become much more prominent in factories. This mechanization made some factories an assemblage of unskilled laborers performing simple and repetitive tasks under the direction of skilled foremen and engineers. In some cases, the advancement of such mechanization substituted for low-skilled workers altogether. Both the number of unskilled and skilled workers increased, as their wage rates grew. Engineering colleges were established to feed the enormous demand for expertise. Together with rapid growth of small business, a new middle class was quickly growing, especially in northern cities. The period from 1870 to 1890 saw the greatest increase in economic growth in such a short period as ever in previous history. Living standards improved significantly as the prices of goods fell dramatically due to the increases in productivity. This caused unemployment and great upheavals in commerce and industry, with many laborers being displaced by machines and many factories, ships, and other forms of fixed capital becoming obsolete in a very short time span. Crop failures no longer resulted in starvation in areas connected to large markets through transport infrastructure. By 1870, the work done by steam engines exceeded that done by animal and human power. Horses and mules remained important in agriculture until the development of the internal combustion tractor near the end of the Second Industrial Revolution. Improvements in steam efficiency, such as triple-expansion steam engines, allowed ships to carry much more freight than coal, resulting in greatly increased volumes of international trade. The Second Industrial Revolution continued into the twentieth century with early factory electrification and the production line, and ended at the start of the World War I. Completed in 1869, the Transcontinental Railroad served as a vital link for trade, commerce, and travel between the East and West of the United States. Railroads replaced stagecoach lines and wagon trains, and provided safer, faster, and cheaper transportation for goods and passengers. Many of the workers on the railroad were army veterans and Irish and Chinese immigrants. Known as the “Pacific Railroad” when it opened, the railroad served as a vital link for trade, commerce, and travel and opened up vast regions of the North American heartland for settlement. First Transcontinental Railroad: A term for a contiguous railroad line constructed in the United States between 1863 and 1869 west of the Mississippi and Missouri Rivers to connect the Pacific coast at San Francisco Bay with the existing eastern U.S. rail network at Council Bluffs, Iowa. Great American Desert: A term used in the nineteenth century to describe the western part of the Great Plains east of the Rocky Mountains in North America to about the 100th meridian. The area is now usually referred to as the “High Plains,” and the original term is now sometimes used to describe the arid region of the Southwest, which includes parts of northern Mexico and the four deserts of North America. Stagecoach: A type of covered wagon for passengers and goods, strongly sprung and drawn by four horses, usually four-in-hand. Widely used before the introduction of railway transport, it made regular trips between stages or stations, which were places of rest provided for wagon travelers. The First Transcontinental Railroad was built between 1863 and 1869 to join the eastern and western halves of the United States. Begun right before the American Civil War, its construction was considered to be one of the greatest American technological feats of the nineteenth century. Known as the “Pacific Railroad” when it opened, it served as a vital link for trade, commerce, and travel and opened up vast regions of the North American heartland for settlement. Shipping and commerce could thrive away from navigable watercourses for the first time since the beginning of the nation. Much of this line is still used by the California Zephyr, although some parts were rerouted or abandoned. Many army veterans and Irish emigrants were the main workers on the Union Pacific, while most of the engineers were ex-army men who had learned their trade keeping the trains running during the American Civil War. The Central Pacific Railroad, facing a labor shortage in the more sparsely settled West, relied on Chinese laborers who did prodigious work building the line over and through the Sierra Nevada mountains and then across Nevada to northern Utah. The Chinese were commonly referred to at the time as “Celestials” and China as the “Celestial Kingdom.” Labor-saving devices in those days consisted primarily of wheelbarrows, horse- or mule-pulled carts, and a few railroad-pulled gondolas. The construction work involved an immense amount of manual labor. Initially, Central Pacific had a hard time hiring and keeping unskilled workers on its line, as many would leave for the prospect of far more lucrative gold or silver mining options elsewhere. Most of these Chinese workers were represented by a Chinese “boss” who acted as a translator, collected salaries for his crew, enforced discipline, and relayed orders from an American general supervisor. Most Chinese workers spoke only rudimentary or no English, and the supervisors typically only learned rudimentary Chinese. Most of the men received between $1 and $3 per day, the same as unskilled white workers; but the workers imported directly from China sometimes received less. The track laying was divided up into various parts. In advance of the track layers, surveyors consulting with engineers determined where the track would go. Workers then built and prepared the roadbed; dug or blasted through hills; filled in washes; built trestles, bridges, or culverts across streams or valleys; made tunnels if needed; and laid the ties. The actual track-laying gang would then lay rails on the previously laid ties positioned on the roadbed, drive the spikes, and bolt the fishplate bars to each rail. At the same time, another gang would distribute telegraph poles and wire along the grade, while the cooks prepared dinner and the clerks busied themselves with accounts and records, using the telegraph line to relay requests for more materials and supplies or to communicate with supervisors. Usually the workers lived in camps built near their work site. Tunnels were blasted through hard rock by drilling holes in the rock face by hand and filling them with black powder. Sometimes cracks were found which could be filled with powder and blasted open. The loosened rock would be collected and hauled out of the tunnel for use in a fill area or as roadbed, or else dumped over the side as waste. A foot or so advance on a tunnel face was a typical day’s work. Some tunnels took almost a year to finish; the Summit Tunnel, the longest, took almost two years. In the final days of working in the Sierras, the recently invented nitroglycerin explosive was introduced and used on the last tunnels including Summit Tunnel. 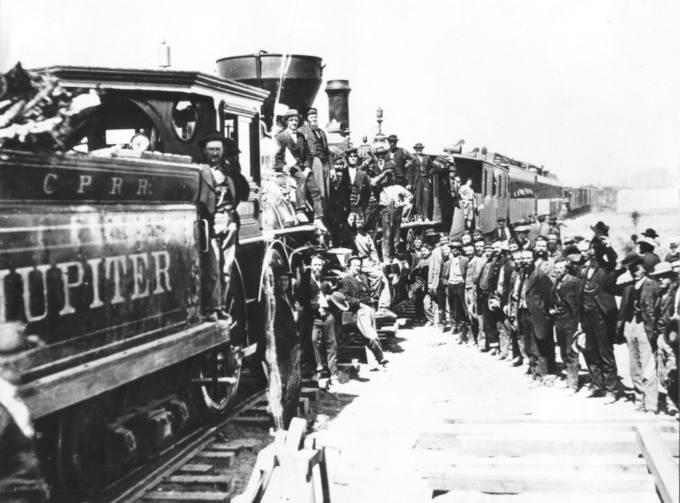 Finishing the First Transcontinental Railroad: Workers celebrating the completion of the First Transcontinental Railroad on May 10, 1869. The mechanization of the manufacturing process allowed workers to be more productive in less time and factories to operate more efficiently. Many of the new workers were unskilled laborers who performed simple, repetitive tasks. New systems of management with clear chains of command and complex bureaucratic systems began with railroad companies and spread throughout American businesses. Many new blue-collar jobs appeared in manufacturing, as well as white-collar jobs for managers. By the beginning of the 1900s, the United States had the highest per capita income and industrial production in the world, with per capita incomes double those of Germany and France, and 50 percent higher than those of Britain. mechanization: The use of machinery to replace human or animal labor, especially in agriculture and industry. management: Administration; the process or practice of running an organization. efficiency: The extent to which time is well used for the intended task. 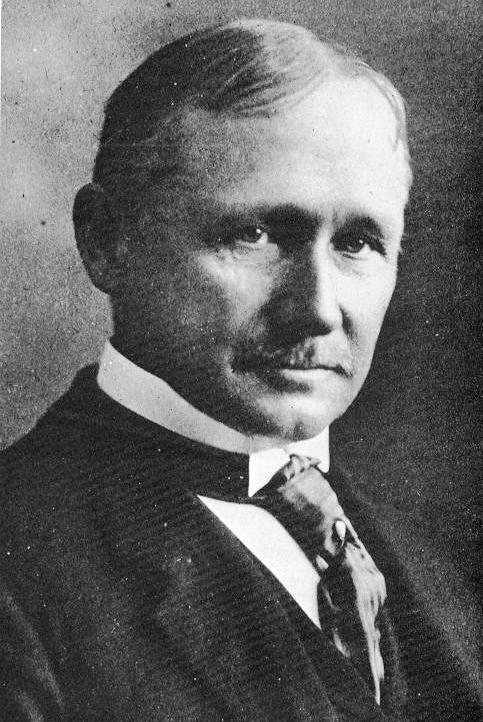 Frederick Winslow Taylor: Frederick Winslow Taylor, a mechanical engineer by training, is often credited with inventing scientific management and improving industrial efficiency. The Gilded Age was marked by increased mechanization in manufacturing. Businesses searched for cheaper and more efficient ways to create products. Corporate officials used various techniques, such as timing their workers with stopwatches and using stop-motion photography, to study the production process and improve efficiency. Frederick Winslow Taylor observed that the use of more advanced machinery could improve efficiency in steel production by requiring workers to make fewer motions in less time. His redesign increased the speed of factory machines and the productivity of factories while undercutting the need for skilled labor. Factories became an assemblage of unskilled laborers performing simple and repetitive tasks under the direction of skilled foremen and engineers. Machine shops, comprised of highly skilled workers and engineers, grew rapidly. The number of unskilled and skilled workers increased as their wage rates grew. Engineering colleges were established to feed the enormous demand for expertise. Railroads gave rise to the development of modern management techniques, such as the use of clear chains of command, statistical reporting, and complex bureaucratic systems. Railroad companies systematized the roles of middle managers and set up explicit career tracks. They hired young men at age 18–21 and promoted them internally until a man reached the status of locomotive engineer, conductor, or station agent at age 40 or so. Career tracks were offered to skilled blue-collar workers and white-collar managers, starting in railroads and expanding into finance, manufacturing, and trade. Together with rapid growth of small business, a new middle class was rapidly growing, especially in northern cities. Extensive national networks for transportation and communication were created. The corporation became the dominant form of business organization, and a managerial revolution transformed business operations. By the beginning of the 1900s, the United States had the highest per capita income and industrial production in the world, with per capita incomes double those of Germany and France, and 50 percent higher than those of Britain. The telephone and electric lightbulb are perhaps the two most influential nineteenth-century inventions. Alexander Graham Bell invented the first workable telephone, basing his invention on a series of previous primitive examples. Thomas Edison, commonly credited with inventing the lightbulb, actually experimented with previous inventors’ ideas to create the first commercially successful lightbulb by perfecting the filament material. Edison founded the successful Menlo Park research lab to produce innovation. Edison and Nikola Tesla both advocated different systems of electricity delivery; eventually, Tesla’s alternating current (AC) system proved more practical. alternating current: An electric current in which the direction of flow of the electrons reverses periodically having an average of zero, with positive and negative values; especially such a current produced by a rotating generator or alternator. Nikola Tesla: (July 10, 1856–January 7, 1943) A Serbian-American inventor, physicist, mechanical engineer, electrical engineer, and futurist who was an important contributor to the use of commercial electricity, and is best known for his contributions to the modern alternating current (AC) electrical supply system. direct current: An electric current in which the electrons flow in one direction, but may vary with time. Alexander Graham Bell is commonly credited as the inventor of the first practical telephone. He was the first to obtain a patent, in 1876, for an, “apparatus for transmitting vocal or other sounds telegraphically,” after experimenting with many primitive sound transmitters and receivers. 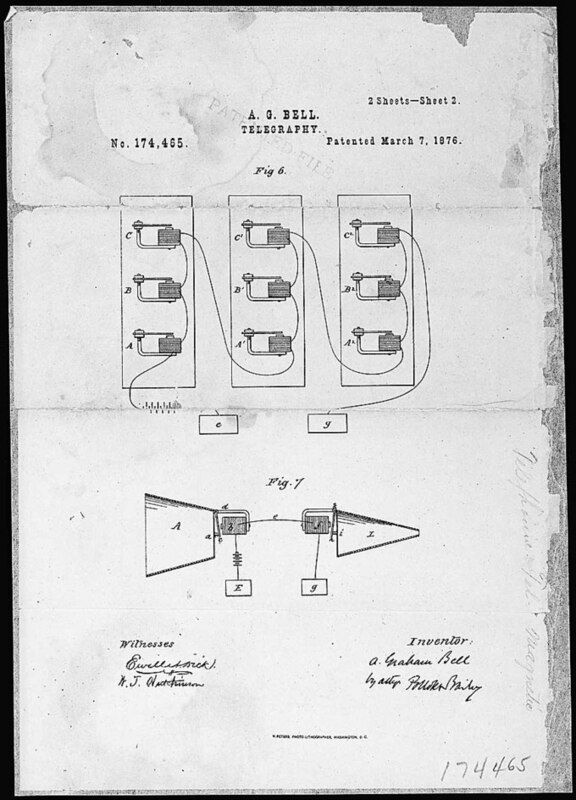 Patent drawing for Alexander Graham Bell’s telephone, March 7, 1876: Bell’s telephone was the first apparatus to transmit human speech via machine. His work culminated in one of the most profitable and contested of all nineteenth-century patents. Bell’s telephone transmitter (microphone) consisted of a double electromagnet, in front of which a membrane, stretched on a ring, carried an oblong piece of soft iron cemented to its middle. A funnel-shaped mouthpiece directed the voice sounds upon the membrane, and as it vibrated, the soft iron “armature” induced corresponding currents in the coils of the electromagnet. After traversing the wire, these currents passed through the receiver, which consisted of an electromagnet in a tubular metal can that had one end partially closed by a thin circular disc of soft iron. When the undulatory current passed through the coil of this electromagnet, the disc vibrated, thereby creating sound waves in the air. The first long-distance telephone call was made on August 10, 1876, by Bell from the family homestead in Brantford, Ontario, to his assistant located in Paris, Ontario, some 10 miles away. In June 1876, Bell exhibited a telephone prototype at the Centennial Exhibition in Philadelphia. The telephone was instrumental to modernization and labor. It aided in the development of suburbs and the separation of homes and businesses, but also became the reason for the separation between women occupying the private sphere and men in the public sphere. This would continue to isolate women and the home. Women were regarded as the most frequent users of the telephone. As a means of liberation, it enabled women to work in the telecommunications sector as receptionists and operators. The autonomy was celebrated as women were able to develop new relationships and nurture preexisting ones in their private lives. Social relations are essential to the access and usage of telephone networks. Thomas Edison’s major innovation was the first industrial research lab, which was built in Menlo Park, New Jersey, and was the first institution set up for the specific purpose of producing constant technological innovation. Most of the inventions produced there were legally attributed to Edison, though many employees carried out research and development under his direction. Edison did not invent the first electric lightbulb, but rather the first commercially practical incandescent light. Many earlier inventors had previously devised incandescent lamps, including Henry Woodward and Mathew Evans. Others such as Humphry Davy, James Bowman Lindsay, Moses G. Farmer, William E. Sawyer, Joseph Swan, and Heinrich Göbel had developed early and commercially impractical incandescent electric lamps. These early bulbs had an extremely short life, were expensive to produce, or drew a high electric current, making them difficult to produce on a large commercial scale. By 1879, Edison had produced a new concept: a high resistance lamp in a very high vacuum, which would burn for hundreds of hours. While earlier inventors had produced electric lighting in laboratory conditions, dating back to a demonstration of a glowing wire by Alessandro Volta in 1800, Edison concentrated on commercial application. He was able to sell the concept to homes and businesses by mass-producing relatively long-lasting lightbulbs and creating a complete system for the generation and distribution of electricity. Electric lighting in factories greatly improved working conditions, eliminating the heat and pollution caused by gas lighting, and reducing the fire hazard to the extent that the cost of electricity for lighting often was offset by the reduction in fire insurance premiums. Electric light was much brighter than that of oil or gas lamps, and there was no soot. Although early electricity was very expensive compared to today, it was far cheaper and more convenient than oil or gas lighting. In 1831 and 1832, Michael Faraday discovered the operating principle of electromagnetic generators. The principle, later called “Faraday’s Law,” is that an electromotive force is generated in an electrical conductor that is subjected to a varying magnetic flux, as for example, in a wire moving through a magnetic field. The improvements in electrical-generation technology increased the efficiency and reliability greatly in the nineteenth century. The first magnetos only converted a few percent of mechanical energy to electricity. By the end of the nineteenth century, the highest efficiencies were more than 90 percent. In the early days of commercial electric power, transmission of electric power at the same voltage as used by lighting and mechanical loads restricted the distance between generating plant and consumers. In 1882, generation was with direct current (DC), which could not easily be increased in voltage for long-distance transmission. Different classes of loads (for example, lighting, fixed motors, and traction/railway systems) required different voltages, and so used different generators and circuits. Due to this specialization of lines and because transmission was inefficient for low-voltage high-current circuits, generators needed to be near their loads. It seemed, at the time, that the industry would develop into what is now known as a “distributed generation system,” with large numbers of small generators located near their loads. The transmission of electric power with alternate current (AC) became possible in 1881 after Lucien Gaulard and John Dixon Gibbs built what they called the “secondary generator,” an early transformer provided with 1:1 turn ratio and open magnetic circuit. Edison’s true success, like that of his friend Henry Ford, was in his ability to maximize profits by establishing mass-production systems and obtaining intellectual-property rights. George Westinghouse became an adversary of Edison when he promoted the direct current (DC) for electric power distribution instead of the more easily transmitted alternating current (AC) system invented by Nikola Tesla and promoted by Westinghouse. Unlike DC, AC could be stepped up to very high voltages with transformers, sent over thinner and cheaper wires, and stepped down again at the destination for distribution to users. The problem with DC was that power plants could only deliver DC electricity economically to customers within about one and a half miles (about 2.4 km) from the generating station, so that it only was suitable for central business districts. When George Westinghouse suggested using high-voltage AC instead, as it could carry electricity hundreds of miles with only marginal loss of power, Edison waged a “War of Currents” to prevent the adoption of the AC system. The war against AC involved Edison in the development and promotion of the electric chair (using AC) as an attempt to portray AC as having greater lethal potential than DC. Edison continued to carry out a brief but intense campaign to ban the use of AC or to limit the allowable voltage for safety purposes. As part of this campaign, Edison’s employees publicly electrocuted animals to demonstrate the dangers of AC. On one of the more notable occasions, Edison’s workers electrocuted Topsy the elephant at Luna Park, near Coney Island, after she had killed several men and her owners wanted her put to death. AC eventually replaced DC in most instances of generation and power distribution, enormously extending the range and improving the efficiency of power distribution. Though widespread use of DC ultimately lost favor for distribution, it exists today primarily in long-distance high-voltage direct current (HVDC) transmission systems. 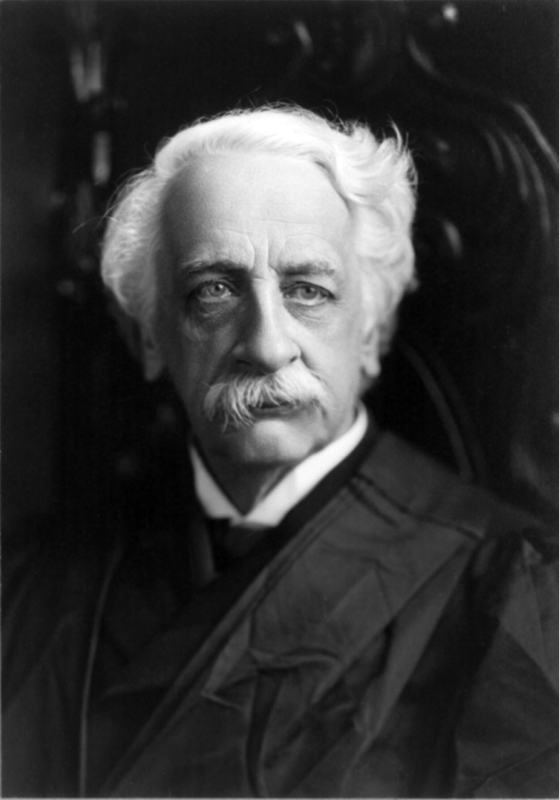 During the Lochner Era, the Supreme Court advocated a laissez-faire economic policy. Lochner v. New York (1905), was a landmark U.S. Supreme Court case that held a “liberty of contract” that was implicit in the Due Process Clause of the Fourteenth Amendment. By a five to four vote, the Supreme Court rejected the argument that the contested New York law limiting a baker’s working hours was necessary to protect the health of bakers, deciding instead that it was a labor law attempting to regulate the terms of employment. In the 30-year Lochner Era, the Supreme Court issued several controversial decisions invalidating progressive federal and state statutes that sought to regulate working conditions during the Progressive Era and the Great Depression. “Laissez-faire” is an economic environment in which transactions between private parties are free from tariffs, government subsidies, and enforced monopolies, with only enough government regulations sufficient to protect property rights against theft and aggression. Lochner v. New York: A landmark U.S. Supreme Court case which held that “liberty of contract” was implicit in the Due Process Clause of the Fourteenth Amendment. The case involved a New York law that limited the number of hours that a baker could work each day to 10, and limited the number of hours that a baker could work each week to 60.
laissez-faire: An economic environment in which transactions between private parties are free from tariffs, government subsidies, and enforced monopolies, with only enough government regulations sufficient to protect property rights against theft and aggression. Lochner v. New York (1905), was a landmark U.S. Supreme Court case that held that the notion of a “liberty of contract” was implicit in the Due Process Clause of the Fourteenth Amendment. The case involved a New York law called the “Bakeshop Act” that limited the number of hours that a baker could work each day to 10, and limited the number of hours that a baker could work each week to 60. In 1899, Joseph Lochner, owner of Lochner’s Home Bakery in Utica, New York, was indicted on a charge that he violated the Bakeshop Act, in that he wrongfully and unlawfully permitted an employee working for him to work more than 60 hours in one week. Lochner was fined twice for the offense and decided to appeal his second conviction. Justice Rufus Wheeler Peckham: Rufus Wheeler Peckham, associate justice of the U.S. Supreme Court (1895–1909), and author of the Court’s opinion in Lochner v. New York. Lochner’s appeal was based on the Fourteenth Amendment to the Constitution, which provides the following: “… nor shall any State deprive any person of life, liberty, or property, without due process of law.” In a series of cases starting with Dred Scott v. Sandford (1857), the Supreme Court established that the Due Process Clause (found in both the Fifth and Fourteenth Amendments) is not merely a procedural guarantee, but also a substantive limitation on the type of control the government may exercise over individuals. Although this interpretation of the Due Process Clause is a controversial one, it had become firmly embedded in American jurisprudence by the end of the nineteenth century. Lochner argued that the right to freely contract was one of the rights encompassed by substantive due process. By a five to four vote, the Supreme Court rejected the argument that the law was necessary to protect the health of bakers, deciding it was a labor law attempting to regulate the terms of employment, and calling it an, “unreasonable, unnecessary, and arbitrary interference with the right and liberty of the individual to contract.” Seven years earlier, the Supreme Court had accepted the argument that the Due Process Clause protected the right to contract in Allgeyer v. Louisiana (1897). Justice Rufus Peckham wrote for the majority, while Justices John Marshall Harlan and Oliver Wendell Holmes, Jr., filed dissents. Justice Harlan’s dissent argued that the Court gave insufficient weight to the state’s argument that the law was a valid health measure addressing a legitimate state interest. Justice Holmes’s famous dissent criticized the decision for discarding sound constitutional interpretation in favor of personal beliefs. Although it was only three paragraphs long, Holmes’s dissent is well remembered and often quoted. In it, Holmes accused the majority of judicial activism, claiming that the case was, “decided upon an economic theory which a large part of the country does not entertain.” He also attacked the idea that the Fourteenth Amendment protected the unbridled liberty of contract, writing that, “[t]he Fourteenth Amendment does not enact Mr. Herbert Spencer ‘s Social Statics.” This was a reference to a book in which Spencer advocated a strict laissez-faire economic philosophy. The term “laissez-faire” refers to an economic environment in which transactions between private parties are free from government interference such as regulations, privileges, tariffs, and subsidies. The term is part of a larger French phrase and literally translates to “let (it/them) do,” but in this context, usually means to “let go.” Laissez-faire, a product of the Enlightenment, was, “conceived as the way to unleash human potential through the restoration of a natural system, a system unhindered by the restrictions of government.” In a similar vein, Adam Smith viewed the economy as a natural system and the market as an organic part of that system. Smith saw laissez-faire as a moral program, and the market its instrument to ensure men the rights of natural law. By extension, free markets become a reflection of the natural system of liberty. Lochner v. New York was one of the most controversial decisions in the Supreme Court’s history, giving its name to what is known as the “Lochner Era.” During the Lochner Era, the Supreme Court issued several controversial decisions invalidating progressive federal and state statutes that sought to regulate working conditions during the Progressive Era and the Great Depression. Thus, this era could be characterized as laissez-faire. The Lochner era often is considered to have ended with West Coast Hotel Co. v. Parrish (1937), in which the Supreme Court took a much broader view of the government’s power to regulate economic activities. The term “robber baron” was applied to powerful nineteenth-century industrialists who were viewed as having used questionable practices to amass their wealth. On the other hand, “captains of industry” were business leaders whose means of amassing a personal fortune contributed positively to the country in some way. Robber barons were accused of eliminating competition through predatory pricing and then overcharging when they had a monopoly. The term combines the concept of a criminal robber with an illegitimate aristocrat baron. The term “robber baron” contrasted with the term “captain of industry,” which described industrialists who also benefitted society. Nineteenth-century robber barons included J.P. Morgan, Andrew Carnegie, Andrew W. Mellon, and John D. Rockefeller. In order to prevent single companies from developing a monopoly over an entire industry, public officials during this era put passing and enforcing strong antitrust laws high on their agenda. captains of industry: Business leaders whose means of amassing a personal fortune contributes positively to the country in some way. Robber baron: A derogatory metaphor of social criticism originally applied to certain late nineteenth-century American businessmen who used unscrupulous methods to get rich. Sherman Antitrust Act of 1890: A law that prohibits certain business activities that federal government regulators deem to be anticompetitive, and that requires the federal government to investigate and pursue trusts. “Robber baron” is a derogatory term used for some powerful nineteenth-century American businessmen. By the 1890s, the term was typically applied to businessmen who were viewed as having used questionable practices to amass their wealth. These “questionable practices” usually included a perception that they offered their products at extremely low prices as to pay their workers very poorly and buying out the competitors that couldn’t keep up. Once there was no competition, the businessmen would hike prices far above the original level. It combines the notions of criminality (“robber”) and illegitimate aristocracy (“baron”). The term derives from the medieval German lords who legally charged tolls on ships traversing the Rhine without adding anything of value. U.S. political and economic commentator Matthew Josephson popularized the term during the Great Depression in a 1934 book by the same title. He attributed the phrase to an 1880 antimonopoly pamphlet about railroad magnates. Josephson alleged that like the German antecedents, American big businessmen amassed huge fortunes immorally, unethically, and unjustly. The theme was popular during the Great Depression, a time of public scorn for the abuses of big business. Robber barons were contrasted with “captains of industry,” a term originally used in the United Kingdom during the Industrial Revolution describing a business leader whose means of amassing a personal fortune contributes positively to the country in some way. This might have been through increased productivity, expansion of markets, providing more jobs, or acts of philanthropy. Some nineteenth-century industrialists who were called “captains of industry” overlap with those called “robber barons,” however. These include people such as J.P. Morgan, Andrew Carnegie, Andrew W. Mellon, and John D. Rockefeller. The positive term was coined by Thomas Carlyle in his 1843 book, Past and Present. John Davison Rockefeller was an American industrialist and philanthropist. He was the founder of the Standard Oil Company, which dominated the oil industry and was the first great U.S. business trust. Rockefeller revolutionized the petroleum industry and defined the structure of modern philanthropy. In 1870, he founded the Standard Oil Company and aggressively ran it until he officially retired in 1897. As kerosene and gasoline grew in importance, Rockefeller’s wealth soared, and he became the world’s richest man and first American worth more than a billion dollars. Adjusting for inflation, he is often regarded as the richest person in American history. Andrew Carnegie was a Scottish-American industrialist who led the enormous expansion of the American steel industry in the late nineteenth century. He was also one of the most important philanthropists of his era. With the fortune he made from the steel industry, he built Carnegie Hall; later he turned to philanthropy and interests in education, founding the Carnegie Corporation of New York, Carnegie Endowment for International Peace, Carnegie Institution of Washington, Carnegie Mellon University and the Carnegie Museums of Pittsburgh. Carnegie gave most of his money to establish many libraries, schools, and universities in the United States, the United Kingdom, Canada, and other countries, as well as to establish a pension fund for former employees. He often is regarded as the second-richest man in history after John D. Rockefeller. John Pierpont Morgan was an American financier, banker, and art collector who dominated corporate finance and industrial consolidation during his time. In 1892, Morgan arranged the merger of Edison General Electric and Thomson-Houston Electric Company to form General Electric. After financing the creation of the Federal Steel Company, he merged in 1901 with the Carnegie Steel Company and several other steel and iron businesses, including Consolidated Steel and Wire Company, to form the United States Steel Corporation. At the height of Morgan’s career during the early 1900s, he and his partners had financial investments in many large corporations and were accused by critics of controlling the nation’s high finance. He directed the banking coalition that stopped the Panic of 1907. He was the leading financier of the Progressive Era, and his dedication to efficiency and modernization helped transform American business. During the late nineteenth century, hundreds of small short-line railroads were being bought up and consolidated into giant systems. Separate laws and policies emerged regarding railroads and financial concerns such as banks and insurance companies. The railroads soon discovered that their pools lacked enforcement power. Those who nominally agreed to be bound by the pooling arrangement could—and often did—cheat. So leaders within the railroad business and beyond began looking for ways to control and manage their increasingly large industry holdings. The corporate form of business enterprise allowed for potentially immense accumulations of capital to be under the control of a small number of managers; but in the 1870s and 1880s, the corporation was not yet established as the dominant legal form of operation. To overcome these disadvantages, clever lawyers for John D. Rockefeller organized his Standard Oil of Ohio as a common-law trust. Trustees were given corporate stock certificates of various companies; by combining numerous corporations into the trust, the trustees could effectively manage and control an entire industry. Within a decade, the Cotton Trust, Lead Trust, Sugar Trust, and Whiskey Trust—along with oil, telephone, steel, and tobacco trusts—had become, or were in the process of becoming, monopolies. Consumers howled in protest. The political parties got the message: In 1888, both Republicans and Democrats put an antitrust plank in their platforms. In 1889, the new president, Republican Benjamin Harrison, condemned monopolies as “dangerous conspiracies” and called for legislation to address the tendency of monopolies to “crush out” competition. The result was the Sherman Antitrust Act of 1890, sponsored by Senator John Sherman, of Ohio. Its two key sections forbade combinations in restraint of trade and monopolizing. The purpose of the Sherman Antitrust Act is not to protect competitors from harm from legitimately successful businesses, nor to prevent businesses from gaining honest profits from consumers, but rather to preserve a competitive marketplace to protect consumers from abuses. Senator Sherman and other sponsors declared that the act had roots in a common-law policy that frowned on monopolies. To an extent, it did, but it added something quite important for the future of business and the U.S. economy: the power of the federal government to enforce a national policy against monopoly and restraints of trade. Nevertheless, passage of the Sherman Antitrust Act did not end the public clamor; 15 years passed before a national administration began to enforce the act, when President Theodore Roosevelt, known as “the Trustbuster,” sent his attorney general after the Northern Securities Corporation, a transportation holding company.